Following the Highland Trail video posted last week, I thought I’d provide some insight into how I approached the filming, what kit I took, what settings I used and so on. Why would you want to waste time filming when you should be racing? 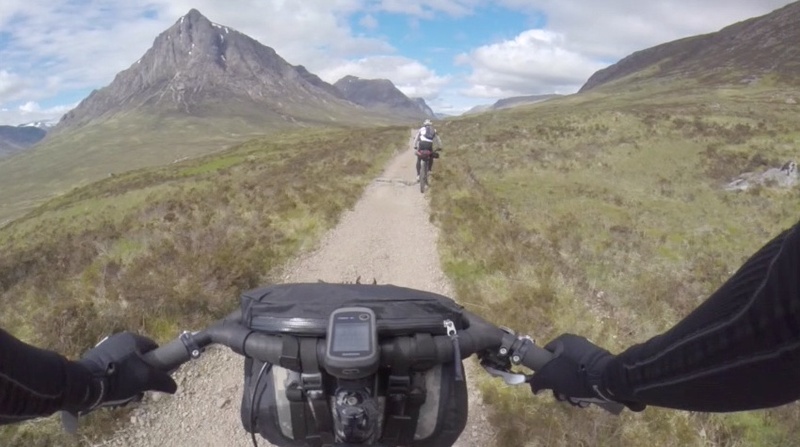 While the Highland Trail appealed to my competitive instincts, I felt I wasn’t quite on the same form as last year, and the challenge of creating a short film appealed to me. The event had proven popular for non-riders too, and this was a chance to show everyone not racing what the Highland Trail was really like. Besides that, it was a suitable distraction from the sharp and committing end of the race. That said, I deliberately didn’t want to spend ages setting up off-bike sequences. I recognised the benefit of including some in the film, but I still wanted to get in a good distance each day, take a short sleep strategy and portray the impact that has on the rider. Up until last month, all my films have been shot using a Contour +2 HD video camera; either helmet or bar mounted, or off-bike on a tripod. When I first acquired a video camera last year, it was a toss up between the Contour and the GoPro Hero3. Comparisons between footage of both cameras seemed to show next to no difference in quality and on finding the Contour at a good price (bearing in mind the Hero3 was still quite new and suffering from some early firmware glitches), that’s what I went for. Whilst I’ve enjoyed using it – and there are some areas where the Contour is better than the GoPro in my opinion – it does have one limitation in that you can’t chest-mount it like you can with a GoPro. Unless I do my helmet strap up so tight I can’t open my mouth, I’ve never managed to get consistently good POV footage from the Contour due to excessive shake off the helmet. After last year’s Highland Trail Race, one of my overriding feelings after completing it was that once was enough – I was not going to go through all that again. It was by far the hardest thing I’d ever done on a bike, and it pushed my physical and mental limits far beyond those I’d encountered in a “normal” 24 hr solo race. Time is a good healer, it seems. My mind had shuffled all the gruelling bits to the back, and memories of good trails and heroic efforts combined to form a comparatively enjoyable experience, albeit one that didn’t involve a lot of sleep. The addition of another 120 miles for the route this year in the form of a northern loop around the Assynt placed it well and truly into the realms of Epic (a much overused words, but in this context it most definitely deserves the capitalisation), and this tantalisingly difficult section on top of what I already knew to be a tough route made it difficult to resist. My final preparation was less than perfect, and nearly didn’t happen at all if it weren’t for the support of Shand Cycles. High drama even continued up to the day before the race when my bike came loose on the bike rack while driving to the train station, ruining a Jones H-Bar in the process. I boarded the train anyway, and set about trying to source a replacement while en route. Keep Pedalling in Manchester came up trumps with a new bar, even going as far as meeting me at the train station to hand it over so I could continue my journey north to Scotland with as little disruption as possible. The air was cold rolling down the road out of Tyndrum. The Highland Trail Race was done, but the riding wasn’t over until I’d got myself back to Ewich House. Having the prospect of a bed for the night was useful incentive to finish the race that evening. I woke up with a jolt. I fumbled for my phone, the only means I had of telling the time with my GPS switched off. It was 5:15 am and very light. I got up quickly to see if Mark’s bike was still in the bothy, and it was. I gathered my kit together in a matter of minutes and was on my way by 5:25 am.